Real estate is local, and drilling down to the factors that shape regions, cities and neighborhoods add nuance to the national picture. Realtor.com anticipates a slowdown period compared to the last two years, based on “the majority of economic indicators.” A moderate national market with dampened price appreciation. 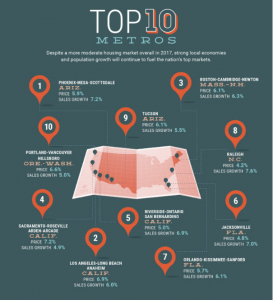 However, the wild West Coast will continue to be a real estate hotspot with leading prices and sales.